Electric Pencil Sharpener- Make Life Easy and Effective: Just sharpens a pencil for seconds! Ideal tool or gifts for all 6-8mm pencils. Elegant design and colors: fitting for an executive office, home Study, classroom, artists, Kids, Adult and more. 1. Make sure that the battery polarities are correct when installing the batteries. 2. Do not mix an old battery with a new one or different types of batteries. 3. Make sure that the cover is closed tightly before using, the sharpener won't work if there is a gap. 4. Don't touch the blade with your fingers or put your fingers into the hole. 5. This product is only applicable to the standard wooden pencil and wooden color pencil (6.5-12mm diameter). 6. Don't use it for sharpening charks, crayons, pens or other plastics product. For customers who use 12mm pencils frequently, we recommend customers to use a USB adapter. 7. Keep the sharpener away from the reach of children under 4 years old. 【Stainless Steel Spiral Blade】: This sharp blade is more durable than a standard pencil sharpener. One by one to ground the pencil, each get a unified advantage. 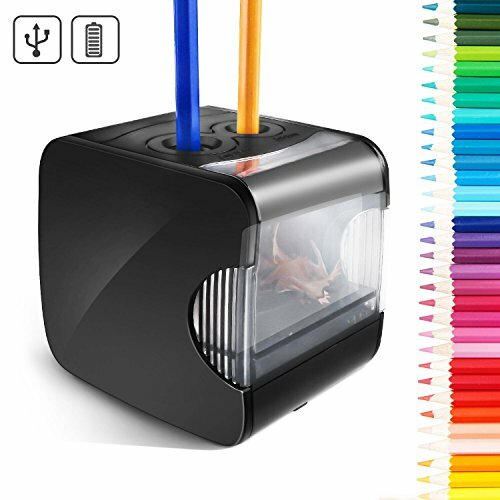 Is the best electric pencil sharpener for adding perfect points to most pencils, including color pencils with pencils, golf pencils and drafting pencils. 【High Efficiency and Space Saving】: Powerful motor can be trimmed in a short time, which can save a lot of time. The compact design and the right size make the pencil sharpener truly space-saving. You can easily get it without any burden or hassle. 【A Variety Of Power】: Our pencil sharpener can use the USB power cord (included) or 4 AA batteries (not included), so you can make shaving more convenient and convenient. If you have any questions about this product by Cool-Shop, contact us by completing and submitting the form below. If you are looking for a specif part number, please include it with your message.